The first in-depth survey of business banking in the North East by the North East Chamber of Commerce (NECC) and Smart Money People has revealed that businesses are moderately satisfied with their banks, but high account charges and slow account opening processes are a concern. Having taken the pulse of 209 North East businesses, we’ve found that although business banking received a 71% overall satisfaction rating, just 19% of all businesses reported receiving a good or excellent level of customer service, demonstrating there is still room for improvement. The results showed that 12% of businesses now use two or more financial providers, a sign that North East businesses are taking advantage of a range of niche, financial firms for items such as foreign exchange or working capital. Surprisingly, only 7% of all respondents cited better access to capital as an improvement they would like to see. A total of 4% of North East businesses stated that they were thinking of switching providers, although 21% mentioned they used a local branch frequently. 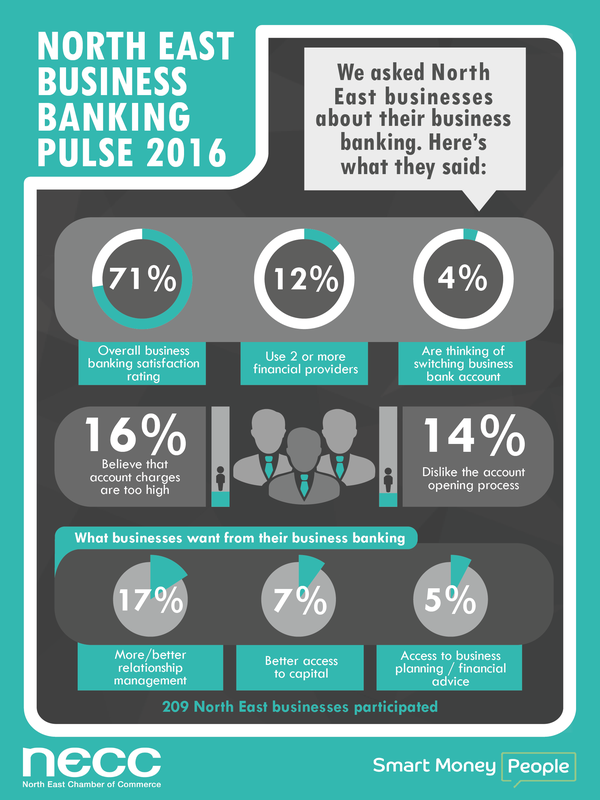 Business banking looks set up become a lot more competitive over the next few years, and you can find out how your bank compares by looking at our best business banking table.